Do I Need to Install Plumbing with My New Hot Tub? Posted on September 8, 2017 , in Hot Tubs. Deciding to buy a hot tub is an exciting occasion and your whole family will be filled with anticipation for the day that it is scheduled to arrive. Many dealers are asked ‘Do I need to install plumbing with my new hot tub?’ from their customers, and the answer is no. 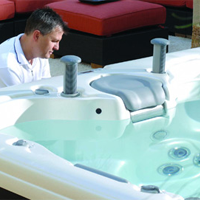 Hydropool hot tubs are actually pre-plumbed and self-contained units, which means that no additional residential water supplies or on-site connections are required. You most likely have other questions regarding the installation of your hot tub and what to expect. Below, we will answer the most common installation questions that we receive. Is This Part of the Service, or Is an Extra Fee Involved? What a dealer may charge for installation fees or include as part of their service can differ and also is dependent on the type of installation and how difficult your hot tub installation will be. Above ground, installations are usually quite straightforward and only need a power supply and concrete base pad. Underground installations are more complex as they require excavation and structural support and will cost more. Either way, make sure you speak with your dealer and ask for an upfront installation quote to avoid any unexpected costs. How Easy/Hard is it to Install a Hot Tub? There is no single answer as to how easy or hard it is to install a hot tub. There are multiple factors which will determine the installation requirements, but one thing is certain – always use professionals. Experienced professionals will ensure that you have the proper foundation and support as well as safe electrical wiring for your unit and guarantee that your hot tub installation is done correctly and safe for people to use. Hot tubs weigh over 700 pounds when they are empty and reach over 4,000 once filled with water and people – not something you want to risk trying to install on your own. With indoor installations, the main concern is ensuring that there is proper ventilation in the room to handle the moisture released from the hot tub and that there is proper drainage. For outdoor installations, the closer the hot tub is placed to your home, the lower the installation charge will be. Electrical wires and panels that connect your hot tub to your home are costly, as well as if you need trenches dug to bury cables, your installation cost will be more expensive. Can I Do It Myself or Get a Friend to Help Me? Although hot tubs do not need new plumbing installed, the complexity of properly inspecting your location and installing your hot tub should always be left to professionals. Buying a hot tub is a large investment and not something you want to risk damaging before you have even used. Even worse, if you attempt installation yourself, you can risk seriously injuring yourself or someone helping you. At California Spa & Fitness, we recommend asking your dealer what specific requirements will be necessary for the installation of your model and also make sure that your electrician reads the owner’s manual prior to connecting. By taking the necessary measures to properly install your hot tub, you and your family can begin to enjoy the wonderful therapeutic benefits they provide. Now that you know the answers to the most common hot tub plumbing and installation questions, download our buyer’s guide to learn more about the features and options available.